Lillian Boraks-Nemetz, a Vancouver poet and author who was a child survivor of the Holocaust, initially declined the offer of a trip to her Polish homeland. She had been there, and written books and poems about her experiences as a child and as a returning adult. She didn’t know that an invitation to go again would lead to an emotional and psychological closure for which she had waited seven decades. When first invited to participate in last spring’s Canadian contingent of March of the Living, Boraks-Nemetz demurred. March of the Living is a program that brings Jewish young people from around the world to the sites of Nazi atrocities in Europe and then to the Jewish homeland of Israel, marching from Auschwitz to Birkenau on Yom Hashoah, Holocaust memorial day, and traveling to Israel in time for Yom Hazikaron, Israel’s remembrance day for fallen soldiers, and Yom Ha’atzmaut, Israeli independence day. March of the Living’s teenage participants are accompanied by Holocaust survivors. “I thought, how am I going to keep up with a bunch of 16-, 17-year-olds?” Boraks-Nemetz said in a recent interview. But she was assured that survivors are well taken care of on the trips and she was convinced to go. “There were difficulties, but I rose to the occasion,” she said, laughing. On the extremely long day traveling from Canada to Poland, which then continued immediately with more travel and programming, Boraks-Nemetz was aided by one of the young participants. “One of the girls had chocolate that had extra caffeine in it, so she gave it to me,” she explained. The program was intensive. The week in Poland involved stays in Krakow and Warsaw, where they visited the Museum of Polish Jews, and they went to the extermination camps Auschwitz-Birkenau and Majdanek. In Warsaw, they also went to the orphanage that had been run by Janusz Korczak. A Polish Jew who was a respected published author, Korczak was offered multiple opportunities to save himself from the advancing Final Solution. When the Warsaw Ghetto was created, Korczak’s orphanage, its staff and nearly 200 young charges were forced to move into the ghetto. When the ghetto was liquidated, in 1942, Korczak was again offered immunity, but instead stayed with his orphaned children as they were deported to Treblinka. In Lodz, the group visited the cemetery and the place where the second-largest Nazi-enforced Jewish ghetto had been. (More than 200,000 Jews were held in Lodz Ghetto during its existence. About 10,000 of those were alive in 1945.) There, the Canadians boarded one of the rail cars that had transported Jews to the camps. At the camps, the participants said prayers and sang mournful songs. An unexpected insight came during conversations with young Polish Jews during an arranged dinner at the hotel in Warsaw. “They sat down, one at each table of students, so they were able to talk,” said Boraks-Nemetz. “At the end of the dinner, I saw the five or six of them standing in the lobby of the hotel, the Polish Jews, and so I went to talk to them. We went to the side and it was really interesting what they told me. They’re quite modern. They’re a little bit shy. They’re a big change from the Israeli youth,” she said, laughing. The young Polish Jews told her that things were pretty good for them. Some go abroad – to France or elsewhere – to study, but jobs are hard to find and the standard of living isn’t great. They had a question about March of the Living. From Poland, the group flew El-Al to Israel. There, the other survivor on the trip, Max Iland, an octogenarian from Sault Ste. Marie, Ont., celebrated his bar mitzvah, a few decades late. “The students were singing and he and I were dancing, it was really fantastic,” said Boraks-Nemetz. The entire experience, she said, was life-altering for the participants. Boraks-Nemetz found especially notable the connection of young Canadian Jews to those who had given their lives in defence of the Jewish state. When the national moment of silence came, the experience was transfixing. For Boraks-Nemetz, the trip provided an unexpected closure to the darkest chapter of her life. 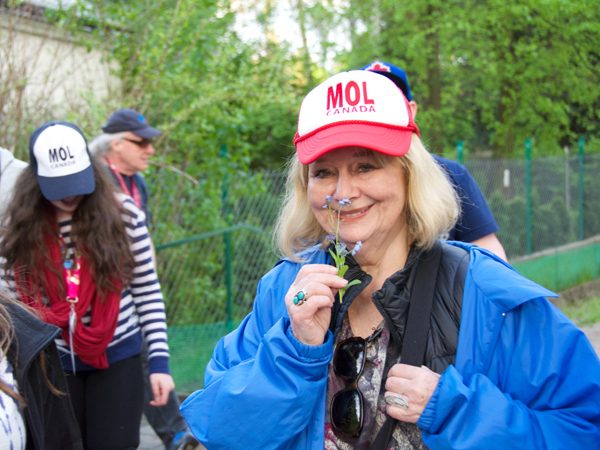 For her, the climactic moments of the March of the Living took place in the small Polish village of Zalesie. It was here that young Lillian survived the Holocaust in hiding. After spending two years in the Warsaw Ghetto, she was smuggled out by her father before the ghetto was liquidated and its residents – more than a quarter million Jews – were sent to Treblinka and other death camps. Outside the ghetto, she was met by a Christian woman who transported her to a little white home in Zalesie, where her grandmother was in hiding, posing as the wife of the Polish man who lived there. Boraks-Nemetz has written about that time in her poetry and in her book for young adults, The Old Brown Suitcase. As an adult, she has returned to the little house at Spokojna Street, Number 16. But this visit was different. There was one part of the story she hadn’t intended to tell, but she had developed closeness and trust with the participants accompanying her. She felt confident and compelled to share more than she ever had before, which led to an unprecedented emotional catharsis after almost seven decades. In small groups of six or eight, the young people accompanied Boraks-Nemetz into the home. Emerging from the chaos of the Syrian civil war, the Islamic State in Iraq and Syria (ISIS) terrorist group has gained the world’s attention for its brutal medieval-style justice and its swift victories in Iraq, threatening to overrun the weak U.S.-backed government there. But now ISIS is also setting its sights on Jordan, threatening to drag Israel into the global jihadist conflict. The goals of ISIS are clear from its name. Alternatively translated as the Islamic State in Iraq and al-Sham (the Arabic name for the Levant region) or the Islamic State in Iraq and the Levant (ISIL), the group seeks to control the entire region, which, in addition to Iraq and Syria, includes Jordan, Lebanon, and even Israel and the Palestinian territories. It was a long trek: 6,000 miles by boat from central Europe to East Asia. But the towns of East Asia opened their gates for the waves of Jewish emigrants who had to find shelter from the tragic problems they faced first in Russia and, later, in Europe. 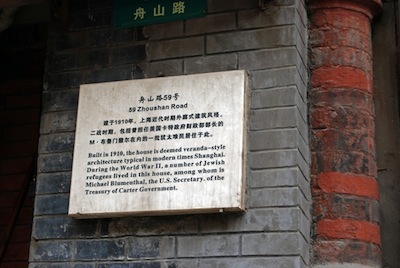 Though some believe their story still flies under the radar when compared to the prevalence of other Holocaust-related discourse – perhaps because most of Shanghai’s Jewish residents viewed their time in the city as a transient stage – historians now know there once was a large and thriving Jewish community in China. Records of immigrants kept by the Hebrew Immigrant Aid Society (HIAS), which operated in Asia from 1917-1950, paint an inescapable picture of Jewish refugees who survived the war in Shanghai. The first Jews, Silk Road traders, arrived in China in the eighth century and settled in Kaifeng. The next Jews were those who arrived under British protection following the First Opium War. Many of these Jews were of Indian or Iraqi origin, due to British colonialism in these regions, and they became the largest dealers in opium. These included David Sasson (the “Rothschild of the East”), philanthropic businessman Sir Eli (Eliazer) Khadori and real estate lord Silas Herdoon. According to most accounts, the number of Sephardi Jews in China totaled around 1,000. Around 4,000 Jews would then arrive as refugees from the Russian Revolution of 1917. Finally, a surge as large as 18,000 Jews arrived as refugees from the Holocaust in the late 1930s and 1940s. According to Peter Nash, a child survivor from Berlin who found refuge in Shanghai from 1939-1949, about 8,000 of these refugees originated from Germany and about 4,000 came from Austria. The Palestinian professor who touched off a maelstrom of controversy by taking a group of students to visit the Auschwitz-Birkenau death camps in Poland is now at odds with his former employer after the school accepted his resignation. Dr. Mohammed S. Dajani Daoudi, who headed the American studies department and served as chief librarian at Al-Quds University, stirred up controversy among Palestinians who felt the March trip was inappropriate. Although the participants were all students at Al-Quds, Dajani said that the trip itself was under the aegis of Wasatia, the nongovernmental organization that he heads whose goal is to “promote a culture of moderation and reconciliation between the Israeli people and the Palestinian people.” But when the trip became a public issue, criticism was leveled at the school and the professor. Dajani said he received threats and the employee and student unions, to which he did not belong, formally banned him from membership. On May 18, Dajani submitted his resignation from Al-Quds University. Incoming university president Imad Abukishek said he was surprised by the resignation, given the lengths he said the school went to on Dajani’s behalf. “We thought he noticed what we did for him and that he would respect what we did for him,” Abukishek said, citing two university-assigned security guards hired to protect Dajani and the school’s attempt to confront the unions to demand the rescinding of the ban issued against the professor. If there’s one act of tikkun olam to which David Katz is dedicated, it’s an effort to clean up the oceans and waterways of the world by recycling and reprocessing plastic waste. 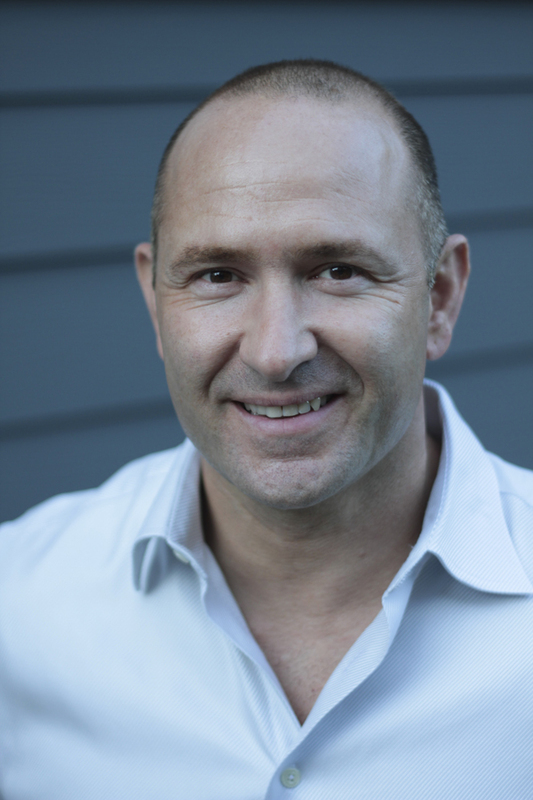 The 45-year-old Port Moody, B.C.-based founder of the Plastic Bank recently returned from Greece, where he was awarded the Global Citizen of the Year Award from the Entrepreneurs Organization. The honor recognizes an entrepreneur who is making a mark on the global landscape, impacting communities, inspiring support and effecting positive change. Katz’s approach to the clean up of plastic at the world’s shorelines is innovative and, if it succeeds, its potential is huge. The idea is that waste-pickers in the most poverty-stricken countries will collect the plastic garbage and deliver it to reprocessing facilities where they’ll receive a credit at the Plastic Bank. They can then use the credit towards education, loans and access to 3-D print shops, where the plastic can be transformed into tools, parts and household items. Katz is engaged in a pilot project with Ciuda Saludable in Peru, an organization that works with communities to increase the volume of plastics collected. He’s in partnership talks with similar organizations in Columbia and has had partnership requests from organizations in 40 different countries to date. Back at home, he worked with the University of British Columbia to develop an extruder, which creates recycled plastic 3-D printing filament, and he’s working with a local plastic reprocessor to create Social Plastic, a brand of recycled plastic. Katz hopes to convince companies to purchase it as a socially responsible alternative to creating new plastics. Lush Cosmetics is one of the companies that has shown an interest in using Social Plastic in their cosmetics tubs and, at the time of publication, Katz was awaiting the final paperwork on Lush’s participation. Convincing companies to come on board with the concept of Social Plastic may be challenging, though. “Potential customers are concerned that once they start using Social Plastic, they’ll always have to use it,” he said. PJ (aka “pajama”) Library is taking the PJ concept to Israel’s Arab population, with the creation of the Lantern Library (Maktabat al-Fanoos, in Arabic). Now Arab, Bedouin and Druze kindergartens, special-education Israeli schools and some preschools will start receiving books. 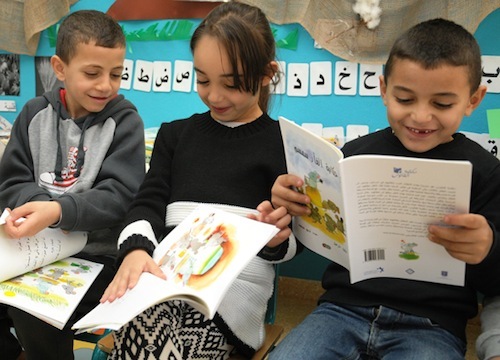 The first book to be distributed is a story about a mouse named Soumsoum, and it has already become quite a sensation in Arab, Bedouin and Druze state-run schools in Israel. Galina Vromen, former international correspondent for Reuters who joined the Harold Grinspoon Foundation more than 10 years ago, launched the Israeli version of PJ Library in 2009, called Sifriyat Pijama, for the Jewish Israeli population. Like its North American parent program, PJ Library, Sifriyat Pijama aims to inspire discussion at home about values and Jewish heritage and to instil a love of books. Unlike the North American program, Sifriyat Pijama books are distributed via government preschools and are then taken home. Lantern Library is a sister program to Sifriyat Pijama and, like its counterpart, Lantern Library books are delivered by courier to each classroom, with a copy for each child and two classroom copies. After the teacher introduces a book and usually also conducts book-related activities (i.e. a discussion, a play, an art project), the book goes home to each student and his/her family. 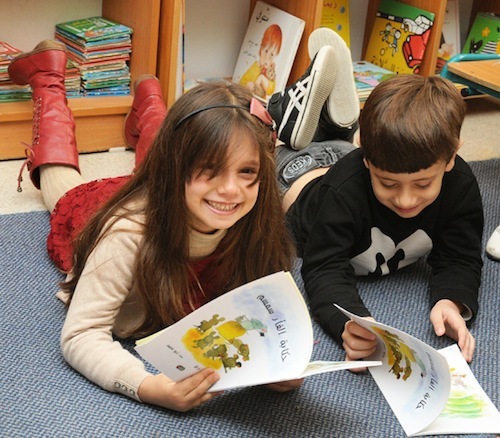 Lantern Library, like Sifriyat Pijama, is funded and operated in partnership with the Israeli Ministry of Education. But with Lantern Library, “We also work with the California-based Price Family Charitable Fund, which has long been active in funding and operating programs for young children and their parents in the Israeli Arab community through its Bidayat (Beginnings) Early Childhood Centres,” said Vromen. 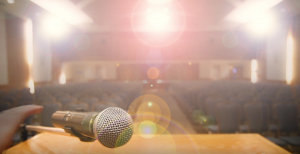 The foundation and the Price Family Charitable Fund committed to start a pilot project this year, with or without the ministry, offering to provide additional matching funds if the ministry came on board. “The ministry did find some funding, so instead of our initial plans to start with 5,000 children, we ended up launching a program for close to 50,000 kids,” said Vromen. The most immediate goal was to get good books out to every classroom and to each child. Other goals were to ensure teachers understand how to effectively integrate the books into the classroom and to understand their role in encouraging parents to read at home. The books have been received with great enthusiasm, added Vromen. “The teachers are extremely positive and send us lots of pictures of the activities they do with the kids. We post some on the program website, which is also exciting for the class. To learn more about Lantern Library, visit al-fanoos.org. English is available by clicking on the top left “En” button on the home page.